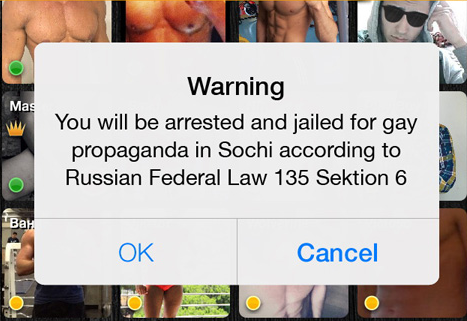 A popular gay Russian dating app has been hacked and a threatening message sent to its more than 72,000 users about the consequences of spreading “gay propaganda” in Sochi, the city due to host the Winter Olympics this week. The message told users of Hunters, similar to Grindr, that their profile would be blocked for the next 55,000 minutes, equivalent to 38 days. Users’ accounts were also deleted across Russia while in Sochi, the app has been blocked. Russia’s “gay propaganda” law has been in the spotlight in recent months with critics fearing for the welfare of LGBT athletes and spectators at the Games. Under the law, the spread of “gay propaganda” — the distribution of information about non-traditional relationships to children — rather than homosexuality is criminalised. Since the passage of the law last summer, LGBT campaigners have reported a rise in homophobic violence in Russia. Hunted, a documentary due to be screened on UK television on 5 February, documents the intimidation and humiliation carried out by anti-gay groups against gay men and lesbian women. A number of high-profile cultural figures including British actor and TV presenter Stephen Fry have called for the boycott of the Games. Last month, Sir Ian McKellen, best known for his role as Gandalf in The Lord of the Rings, wrote an open letter with 27 Nobel Laureates calling on President Vladimir Putin to repeal the law.